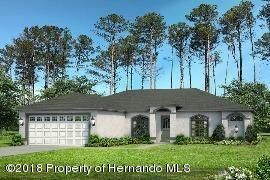 I am interested in 13134 Snowy Plover Avenue, Weeki Wachee, FL 34614. Beautiful Custom Home Under Construction. Estimated Completion April 2019. Secure your New Home at Today's Prices!. USDA 100% Finance Area. Soaring 9'4 Flat Ceilings, Tile Floors, Formal Dining, Spacious Kitchen with 36'' Custom White Shaker Cabinets, Breakfast Nook and Breakfast Bar, Family Room, Split Plan with Over sized Master Suite, Walk in Closet, Walk In Tile Shower. Much more offered and a great price on 1/2 Acre lot with NO Deed Restrictions!